THE Rolls-Royce Owners' Club of Australia is celebrating two big milestones when it arrives in Toowoomba for its annual rally from May 1-6. Not only is it the 50th anniversary of the Queensland branch, it is also the centenary of Bentley Motors. President and rally director Frank Carroll said Toowoomba had been chosen to host the 61st national event because of its blend of old-world charm and modern city, historic buildings, great roads, scenery and food. He is very familiar with the region, with his brother Bob running the Toowoomba-based Australian Events, and his parents having lived there in the 1970s. "Toowoomba's lovely: the roads are good, there are no traffic snarls and the people are really friendly and hospitable," Frank said. The club hopes to have about 90 Rolls-Royce vehicles and 100 Bentleys (befitting the 100th anniversary) at its Carnival of Motoring display at Frogs Hollow, Queens Park, on Sunday, May 5, and hopes as many people as possible will take the chance to see them. "We are very proud of the cars and want to tell people about them," he said. Other marques will also be displayed courtesy of clubs including the Darling Downs Veteran and Vintage Motor Club. "We will have a number of rare and vintage models that people don't often get to see," Frank said. 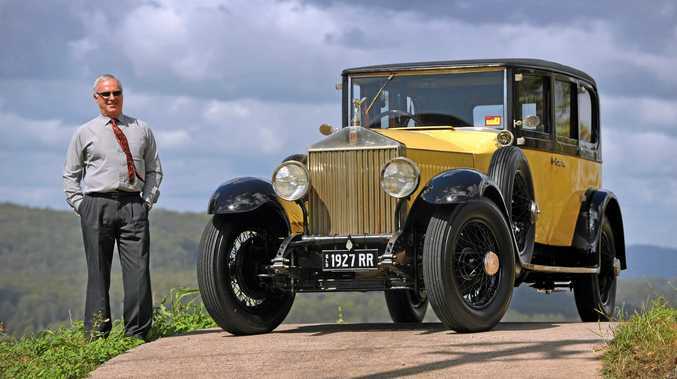 That includes Australia's oldest Rolls-Royce, a 1909 Silver Ghost restored by the late David McPhee, as well as Frank's own 1927 Rolls, which will be on display at Cobb+Co Museum from April 6 to promote the rally. Frank, a solicitor from Coolum on the Sunshine Coast, said he had always been a car enthusiast, but only bought his first Rolls-Royce in 2010. As well as two Bentleys - 1989 and 2000 models - he now owns three Rolls, the 1927, a 1979 and a 2007 Rolls Royce Phantom Pearl limousine, part of a bespoke collection which cost about $1.1 million new, all of which will be on display in Toowoomba. His car collection comprises another 17 predominantly British cars including Austins and MGs, all displayed in a purpose-built showroom at Coolum Industrial Park. It is also the home of the Henry Royce Foundation, of which Frank is a trustee, which is "dedicated to celebrating Henry Royce as a genius of engineering". While owners are "predominantly older folk", Frank said there was no doubt heads of all ages would turn up as club members drove the country roads to events. These include Warwick's Abbey of the Roses on the Thursday, Hampton and Jimbour House on Friday, the Downs Steam Tourist Railway and Museum at Drayton on Saturday followed by Concours judging at Toowoomba Showgrounds at 10am, the Carnival of Motoring at Queens Park on Sunday from 10am and a black-tie dinner at the Empire Theatre, with a farewell breakfast on Monday. For information, phone Frank on 0418 775693 or go to rollsbentleyclub qld.com.